The summer season of Attack on Titan picks up with an oddly-cut and remixed summary episode, which can be skipped entirely if you’ve watched the first season, but it does its job for newcomers to the show. Afterward, we’re dropped into a trial for Eren’s life as the Military Police and the Survey Corps vie for his destiny. The Military Police want him dead, but the Survey Corps see potential for a counterassault. 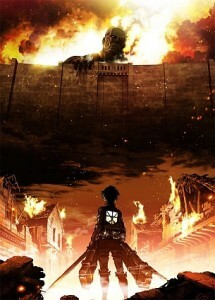 When Eren is finally assigned to the Survey Corps, it’s a bittersweet deal, and he must become accustomed to his new, enigmatic role in the Corps. They can’t waste time, however, and plans to begin an excursion outside the Rose Wall are set in motion even as the Survey Corps suffer a debilitating turn of events with no solid leads. Episode sixteen brings the focus back to Mikasa, Armin, and the others as they struggle with the decision to take the safe route and join the Military Police or to overcome their fears and join the ranks of the Survey Corps. Eren’s position in society as a curiosity and a weapon is a refreshing predicament for a primary character—he possesses fearful but unpredictable power, and this leads to his being a near-outcast. The conditions on his life are dire, and his keeper is a brutal man, unafraid to exact bloody punishment if necessary. I can already hear the doujinshi being scribed for these two. The nature of the titans remains an elusive goal for humanity, but one eccentric scientist is determined to find her way to the heart of the matter, even if she seems particularly enchanted by the macabre beings. This, too, is a pleasant change from the all-knowing, tight-lipped archetype seen so often in the scientist’s role, and I look forward to more screen time for her. I just hope she doesn’t die… which is a valid concern when Titan is so willing to off its characters. There’s a continued edge of tension in this regard, and the second season helps to take the focus away from this tool, reigning it in so that it doesn’t become overused. The choices the new recruits make vary in their motivation, but Titan does an excellent job of regrouping classmates and teammates in a smooth transition. Their struggle with fear is again addressed well, and I, for one, am actually beginning to see some bravery in them—a marked difference from the helpless trainees they were in the first thirteen episodes. Keep it coming, Attack on Titan!